Mr Allbones’ Ferrets – an historical pastoral satirical romance, with mustelids, by Fiona Farrell, 2007. A vintage Book, Random House, NZ. I have just caught up with this book and it was well worth reading, although I found it quite difficult to get into. I realize that this is because it feels very alien and at times repulsive if, like me, you have had no experience of ferrets, and have always regarded mustelids as lethal predators on our birdlife. The way in was for me to enter into an alien cultural experience, the world of English Victorian village life as lived by the most impoverished people. Soon afterwards I was drawn into an equally alien world of affluent middle class scientifically-minded European gentlemen. Colonization of New Zealand falls within the era of modernist project(s) and also at a late stage of British imperialism, when both the techniques and justifications were well-established. This accounts for a lot of settler attitudes and actions. For example, assumptions about their own superiority and entitlements were not thought of as questionable, but as knowledge. Somewhat garbled Darwinism was rife. The English were the fittest, and therefore destined for survival, at the expense of ‘inferior’ humans and all other species. Self-appointed scientists all over Europe and North America pursued the study of extinction as an interesting and inevitable phenomenon. Buller and his ilk sent thousands of the skins and skeletons of birds back to the Natural History Museums of Europe. In Buller’s case this included the shooting of the last Huia. The retrieval and preservation in our time of endangered species like the Takahe and Chatham Island Robin would have been unthinkable and pointless to them. 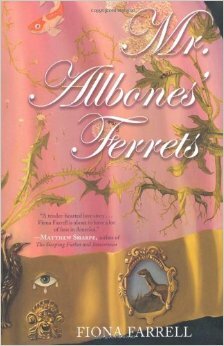 Fiona Farrell’s novel gives an accurate account of the study of extinction and the ignorant disturbing of natural equilibria by the introduction of rabbits, and then stoats and other mustelids to New Zealand. We today are very much affected by actions like those. Our problems with the consequences of the introduction of opossums springs to mind. As I struggle to understand the mindset of the early settlers, but think it something important to explore, I feel grateful to Farrell for what her work has to offer. Her characters undergo the kind of journey which must have been fairly universal and many of the patterns of settler experience, such as changes of identity, anonymity and social confusion are included. The romantic elements are tempered by the satirical approach. By the end I even felt some sympathy for the ferrets who, after all, didn’t choose to emigrate!